For those of us who were in our early teens in the eighties, Michael Bay got it all wrong when he made his first Transformers movie. Listen to me, Mr. Bay: Bumblebee turns into a Volkswagen Beetle; not a Camaro. Travis Knight, the director of the new 2018 Bumblebee movie, was a teenager in the eighties and is a self-confessed Transformers fan. He nailed it. 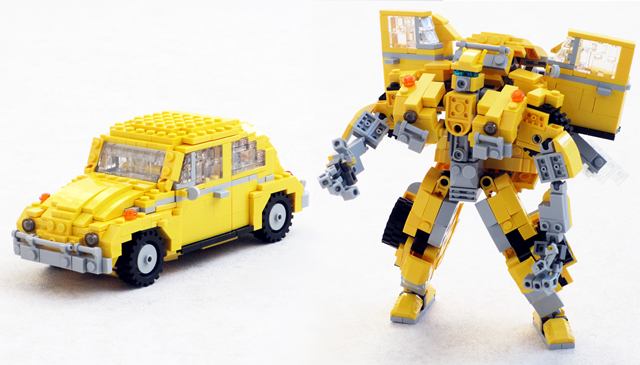 We’ve already featured a really sweet LEGO version in Beetle mode by hachiroku24 and a screen-accurate Bumblebee robot by ekownimako. However, they don’t actually transform. I happen to think that this a pretty essential feature of any Transformer. Making it transform is certainly not easy, but I pored over pictures of new Bumblebee toys released for the movie. I also happen to have a LEGO Beetle design that I like, which I could use as a starting point. It is quite small, though, at about 19 cm long (roughly 7 inches) and there is a lot of stuff that needs to fold into it. 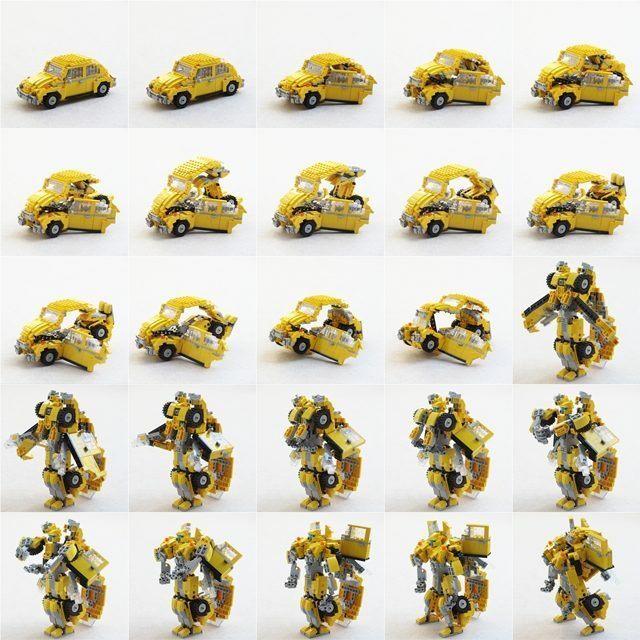 The end result is flimsy, it doesn’t really want to stand upright unsupported and it’s not nearly as nicely proportioned in robot mode as in the movie, but it works: the Beetle unfolds into a Bumblebee. Hell – this is a pretty good Beetle, even if it didn’t transform! Well done. I would also like to give a shout out to the new Bumblebee movie. I wasn’t a fan of the first two Bay movies and never saw the others. But as an ’80s era TF, fan I thought Bumblebee delivered in both heart and story, gave us likeable heroes to cheer for, and immersed us deeply in the ’80s, while still feeling very much like a modern movie. Thank you. My aim was to make it look as much as my existing Beetle despite the transformation. I’m glad you like it. I quite liked the Transformers designs in some of the Michael Bay movies (in particular Optimus Prime as a torpedo nose truck, with the flame job) and the first one was OK, but the second one was so terrible I didn’t even watch it till the end. I didn’t bother with any of the subsequent sequels. I haven’t actually seen Bumblebee yet, but I probably will.